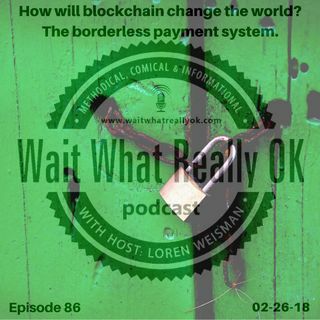 Wait What Really OK Podcast Episode 86 hosted by Branding Strategist and Keynote Speaker Loren Weisman opens a confusing jar filled with words like blockchain, crypto-currency and digital currency with Doug Fish. Doug Fish is the Owner and Educator of Fish Holdings. His down to earth, easy to understand definitions and views on digital currency are worth a listen and a review. With many in the digital currency game ... See More that push, pressure and even insult if you are not buying, Fish takes an approach of informing and empowering individuals with the best information to make the best decisions. No links to tell you what to buy, where to buy, when to buy or how to buy. This episode is featuring a guest that is here to share information and ideas that can help to clarify and explain the foundation of what has the potential to be the greatest game changer of anything we have ever seen. This goes beyond personal wealth and flip flop gains and losses. How will blockchain save the world? With the securest platform that costs almost nothing and the ability to offer businesses around the world more opportunities, options and chances for a greater impact to be made, digital currency can change the world. Episode 86 of the brand management and marketing podcast Wait What Really OK is titled How will blockchain change the world? The borderless payment system.